Six-time champion Serena Williams swept aside Anastasija Sevastova Thursday to reach a ninth US Open final, where she’ll face Japanese trail blazer Naomi Osaka. Williams, seeded 17th as she seeks to add to her 23 Grand Slam titles for the first time since the birth of her daughter Olympia last year, needed just 66 minutes to dispatch the 19th-seeded Sevastova 6-3, 6-0. Osaka, seeded 20th, became the first Japanese woman to reach a Grand Slam final with a 6-2, 6-4 victory over American Madison Keys — last year’s beaten finalist. 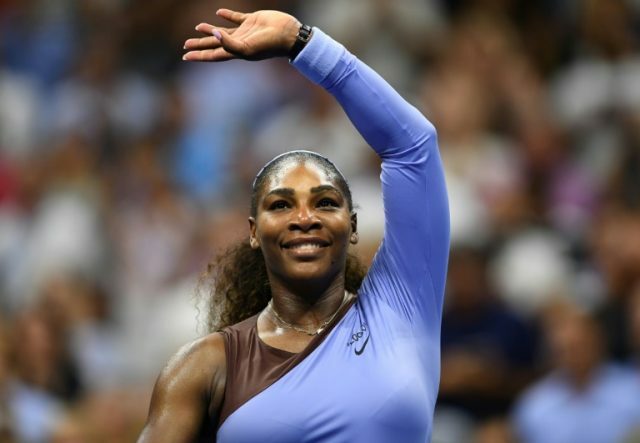 Williams called her return to the US Open final for a ninth time “incredible” given that she was undergoing surgery for life threatening blood clots this time last year in the wake of giving birth. “To come from that, in the hospital bed, not being able to move and walk and do anything, now only a year later, I’m not training, but I’m actually in these finals, in two in a row,” said Williams, who also reached the final at Wimbledon. “To come this far so fast …. I’m really looking forward to the possibilities,” she said. Williams lost out in the semi-finals of her last two US Opens, in 2015 and 2016. But with six titles in New York she needs just one more to surpass Chris Evert for most all-time — and she needs just one more Grand Slam title to equal Australian Margaret Court’s all-time record of 24. Osaka, 20 and in the last four at a Slam for the first time, admitted she was driven by the idea of facing Williams. Osaka, who had already made history along with men’s semi-finalist Kei Nishikori as the first Japanese man and woman to reach the last four at the same Slam, had lost three prior meetings with Keys. “I’m just glad I was able to get through this match,” said Osaka, who broke Keys at love for a 5-2 lead in the first set and after calmly serving it out broke her again to open the second set. She made the break stand up, withstanding six break points in the next game. Her overriding aim as she served for the match, Osaka said, was “Don’t double fault”. In fact she closed it out with a service winner that bounced wildly off the frame of Keys’s racquet. Osaka won her only prior meeting with Williams, in the first round at Miami in March — the American star’s second tournament since giving birth. “I definitely wasn’t at my best,” said Williams, now in her seventh tournament back. As in her semi-final win over Karolina Pliskova, Williams took a while to warm up, dropping her serve in the opening game. But she was back on terms after a break for 2-2, getting the break when Sevastova’s attempt at a drop shot from deep in the court failed to make it over the net. From there Williams was on the attack, winning 24 of 28 points at the net. After breaking again for a 4-2 lead she produced a convincing hold that featured the first of her four aces. “I’ve been working hard on my volleys,” Williams said of her aggressive game plan. she had “I have won a few doubles championships so I know how to volley. “I just usually come in to shake hands,” she quipped, before explaining she thought the tactic would be effective against Sevastova’s mix of spin and slice. Sevastova, who beat defending champion Sloane Stephens to reach the last four, was left regretting “some stupid games from me that I lost”. “I shouldn’t have gotten broken twice in the first set — I had game points in both games,” she said. “When she’s in front, it’s tough to play,” Sevastova said.